The Enhanced Filling Agent is a Blood Magic Alchemy reagent. Applying it to a Potion Flask refill some uses of the potion. 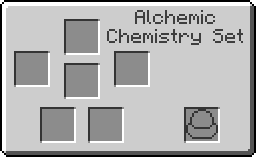 An Agent can be used to refill a potion by placing the Agent and the potion to be refilled into an Alchemic Chemistry Set. Refilling a potion does not require a Blood Orb or any LP. Enhanced Filling Agent has no known uses in crafting. This page was last modified on 16 December 2018, at 12:06.